There are many women who want toned, muscular arms. If yours are sleek and have functional strength, it is an added plus. Having confidence in all your sleeveless tops is just another reason to consider bicep workouts. The first thing to do, is ignore the thought weight training is just for men. You are very unlikely to get bulky from some weight lifting; you lack the hormones. In most cases, women who weight lift will get toned and sleek. Stand with your feet comfortably apart. Take the dumbbells in your hands. Keep your palms up and elbows close to your body. Let your arms fall straight down. Keep your upper arm still, exhale and flex at the elbow, bringing your hands toward your shoulders. Inhale slowly and lower your forearm to the straight position. Complete ten times for a set. Do two more sets after a one-minute break. This exercise puts a new spin on the bicep curl and works the brachialis and brachii muscles. You will need a five-pound dumbbell. Stand with your feet comfortably shoulder-width apart. 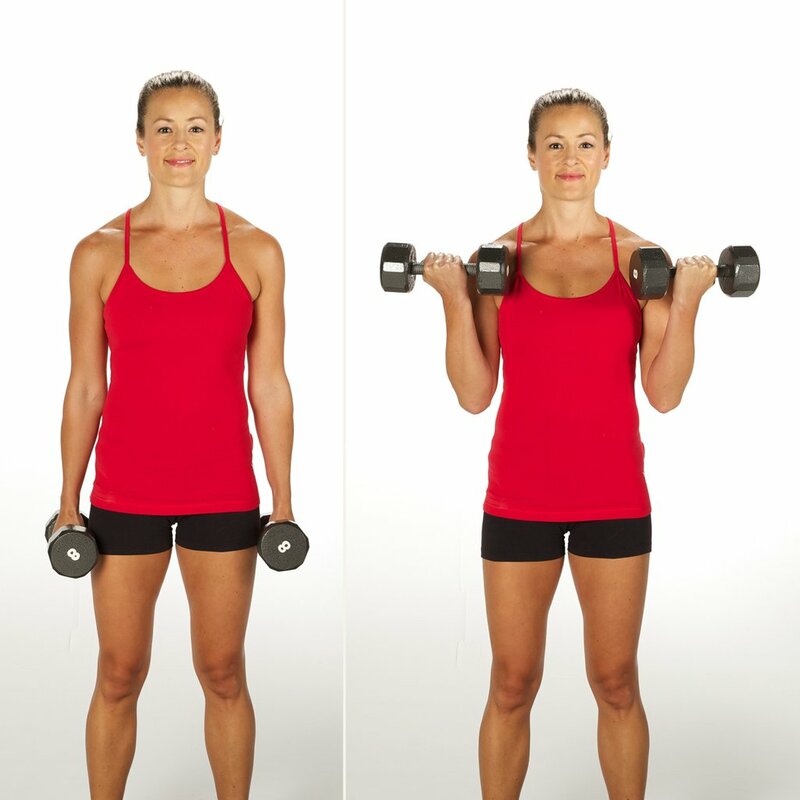 Take the dumbbells in hand and keep your elbows close to your body. With your palms facing your body and your arms staring at ninety-degree angles, then raise your hands toward your shoulders. Inhale slowly, lowering your forearms until in the original position. Repeat another nine times to complete a set. Rest for a minute then repeat twice more. This is one of the great bicep workouts for women. This bicep exercise works all three muscles, the brachioradialis, brachii, and the brachialis. Take the five-pound dumbbells and with your palms facing your body, keep your elbows close, and let your arms hang down. While exhaling, flex at the elbow, bringing your lower arm up and keeping your upper arm still. Suring the movement, rotate your lower arm so that your palms are facing the ceiling. Inhale and lower back to position, with your arms rotated so that your hands face your body. Repeat another nine times for a set. Take a break and repeat for two more sets. Bend at the waist so that your elbow and knee are level. Hold your five-pound weight, and face your palm up. While keeping your upper arm still, exhale and bring your forearm to your chest, keeping your palm up. Inhale slowly, while lowering it back to the beginning position. Take a small break and repeat two more sets. 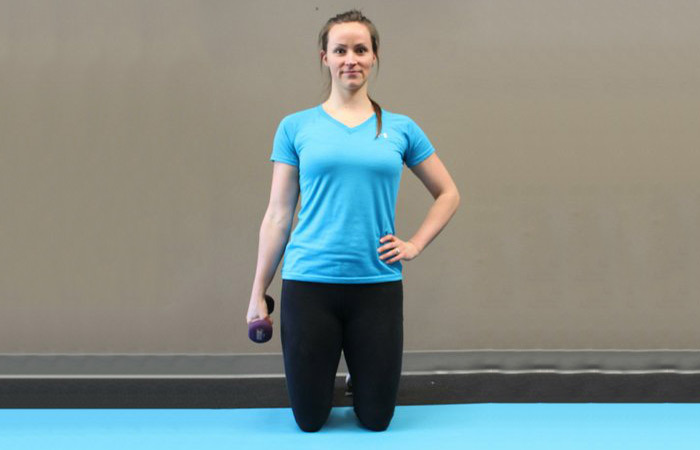 This exercise will help work your brachialis muscle and you can do it sitting or standing. A preacher bench will be needed to keep your shoulders from moving. Sit with your feet comfortably apart. Place your upper right arms on the inclination to support shoulders. Exhale and slowly flex your elbows to bring your palms toward your body, creating a vertical position. Inhale and lower your arms back to the first position. Take a small break and do two more sets with your right arm. 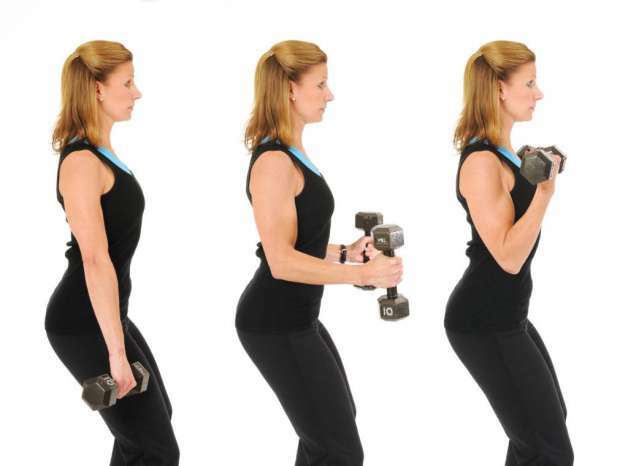 This exercise will get your middle and anterior deltoids, one of the bicep workouts for women. These are the muscles stretch through your upper arm, over the collar bone and cup the shoulder. Stand with your feet shoulder-width apart and keep your knees relaxed. Take your five-pound dumbbell in hand and keep your palms facing your thighs, stretched down. Keep your chest high and shoulders back. Raise your hands up, without bending your elbow, bringing them level with your shoulders. Hold and inhale slowly before lowering your arms back. Kneel down and keep your back straight. Take your five-pound dumbbells, keep your elbows close and your palms facing each other. Exhale and bend your right elbow until the dumbbell is at your shoulders. Inhale and lower your arm to the first position. Repeat nine more times for a set. Take a small break and do two sets with your right arm. Stand with your feet shoulder-width apart and elbows close to your sides. Take your dumbbells and face your palms in. Exhale while lunging forward with your right leg, flex the left knee. 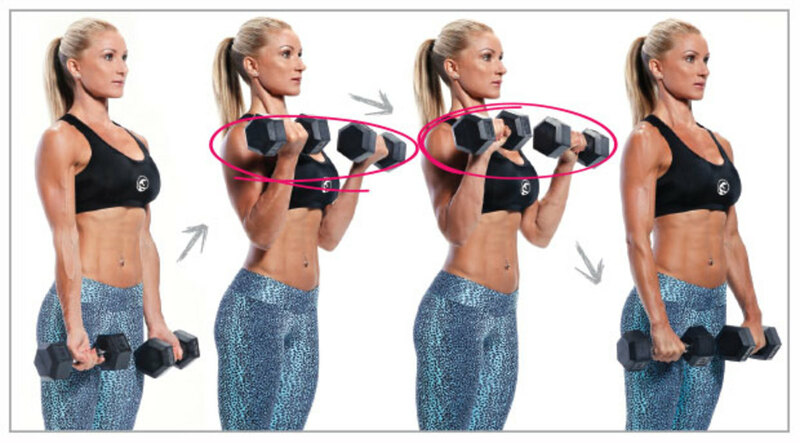 With the above, bend both elbows to raise dumbbells to your shoulders. Inhale, raise your torso, and put your leg back to the starting position. With the above, lower your arms back to the first position. Repeat the above and alternate between your left and right legs. This modified bicep curl works the brachioradialis, brachialis, and brachii, one of the bicep workouts for women. Take your dumbbell, keep your elbows close and your palms facing out. Exhale and bend your elbows to bring your lower arms to your shoulders. Rotate your wrists 180 to face your palms out. Lower your forearm back while inhaling. Take a small break and do another set. This makes the bicep curl more effective, because it works the bicep brachii muscles more exclusively. Take your five-pound dumbbells and lay back on a 45-degree bench. Dangle your hands and keep your palms facing out. Exhale while bending your elbow, drawing your forearm up to your shoulders. Inhale and lower your arm to the original position. The first couple of months, do 12-15 reps of different exercises for muscle endurance. The following couple of months, do 8-10 reps for muscle strength. Change your reps up every so often so you don’t hit a plateau. To get the best results, do the best bicep exercise about three times a week. Rest for 48 hours between working a body part again. Each exercise should get two sets performed. Choose a weight that doesn’t exhaust you for your reps; lighter weights for endurance and heavier for strength. Getting the right weight may take some time.